SHU UEMURA.CA x SPARKYPLAYGROUND GIVEAWAY! Normally, I would have to go to Holt Renfrew (Canada's luxury retailer) or recently from Sephora. However they don't both don't carry a full line of products. With the launch of ShuUemura.ca, I can easily browse and purchase their entire range! The best part is, purchases of $75 or over gets you free shipping!! There are 3 ways to discover shu uemura, I save the best for last so make sure to read until the end of the post!! 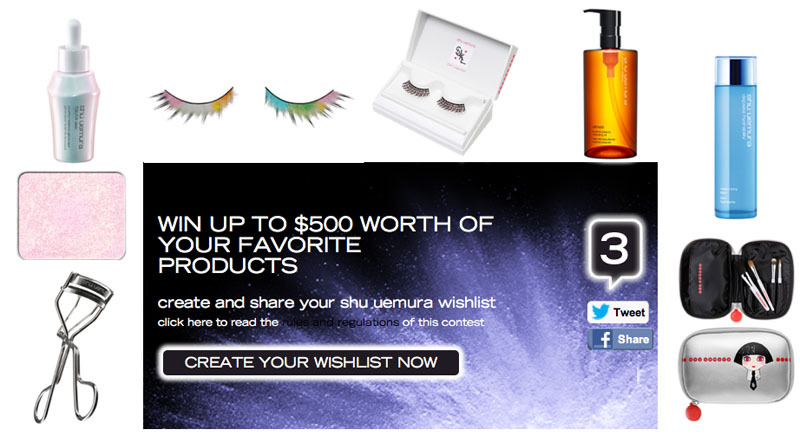 Enter to win a $500 gift card by creating your wish list on shu uemura website! Cleansing oils from their new ob collection is obviously on my wishlist. I'm already a huge cleansing oil freak and now in these extremely cute bottles!!! can win a $100 worth of your favourite products!!! #1: Are you a follower of my blog (Any via GFC, Bloglovin, Facebook Page, Twitter)? #2: Leave the URL of Your favourite product(s) from shu uemura website. Contest will end on April 30th, 2013 at 11:59PM EST. I will announce the winner within 1-3 business days and the prize will be sent out by shu uemura.